It’s a Sunday night, and the contrails are abundant over the Blue Ridge. Being on the flight path for Dulles International Airport, we often have huge jetliners flying over our home, especially during the evening. They are still thousands of feet in the air as they cross the ridge, so there’s usually little noise. We watch the evidence of their long journeys floating in the higher altitudes, sometimes providing us with intricate and colorful aerial designs. As the passengers gaze down at the gorgeous Virginia countryside, we look up and admire the contrails they leave behind and wonder if their destination is as beautiful as the scenery they’re leaving behind. …AND I wondered how many flights it took to form the beautiful patterns. At first, I counted 8 then realized more were fading. I also wondered how many years ago would this have not been possible. When did passenger jets start marking the skies? It’s always interesting to watch them. Some do fade away while others last quite long and linger and mix with the clouds. They do make fascinating art in the skies! Very cool Tricia…nicely written. In answer to Lucinda’s question..contrails form when the air at altitude is cold and humid. The hot exhaust freezes and leaves a trail of ice crystals. Great explanation. Cam and I were debating that night why some contrails hung around and others evaporate right away. I didn’t realize the air had to be humid. Makes sense now that you explain it! 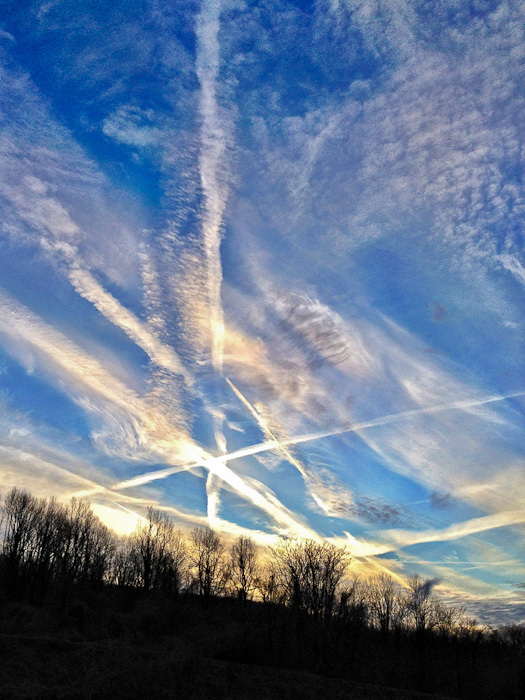 What a wonderful photo and I learned something too – I never knew they were called contrails. Great post. Thank you! Yes, always fun to learn new things about the world around us! David helped very much with the explanation, too.